Super scrappy. All in reproduction fabric. I love it!!!!!! It is a giant. Finished size is 104"x104". I had a difficult time capturing the quilt all in one photo. I referred to my quilt as a "boat sail" as I was putting it all together!! Sewing this on my little retreat sewing table was an arm workout like non other!! This quilt did not start out this big or with this layout. The original quilt design is a gorgeous pattern called "Tool Shed" by Kim Brackett of Magnolia Bay Quilts. The quilt in the book was pieced and quilted by Darlene of Quilting Daze. The quilt originally finished at around 54"x62". The pattern is in a great book that uses 2.5" strips to create quilts. My version is just a bit different. 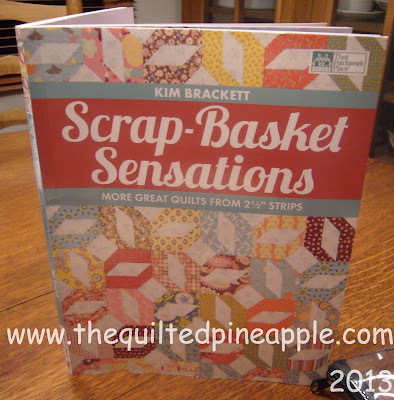 :-) Scrap-Basket Sensations is the book. This is an awesome book for using 2.5" strips. Lots of great designs!! I fell in love with the lap size quilt as soon as I saw it. Initially, I planned on making it all out of Jo Morton fabric, but changed my mind to a variety of reproduction fabric...making it super scrappy. I really admire Kim Diehl quilts. I realized it was her fabric color choices that I was really drawn to. She likes to incorporate cheddars, pinks, purples and golds with the usually muddy reproduction colors (trust me I love me some muddy reproductions too). So that is what I did with my quilt and I LOVE it!!! There were many reasons I changed from a lap size to a king size, but one of the reasons...I made a bunch of blocks "wrong." This is what the "Tool Shed" block looks like and quilt layout. 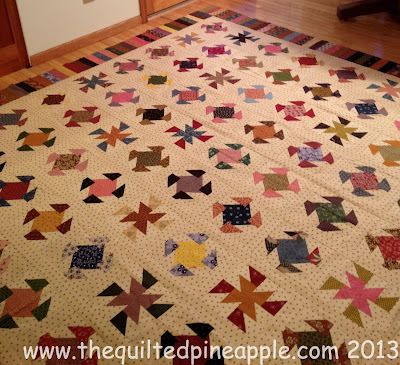 If you go back and look at my quilt, there are the original blocks with some "star" blocks mixed in. I didn't even realize it until I pieced a bunch!! 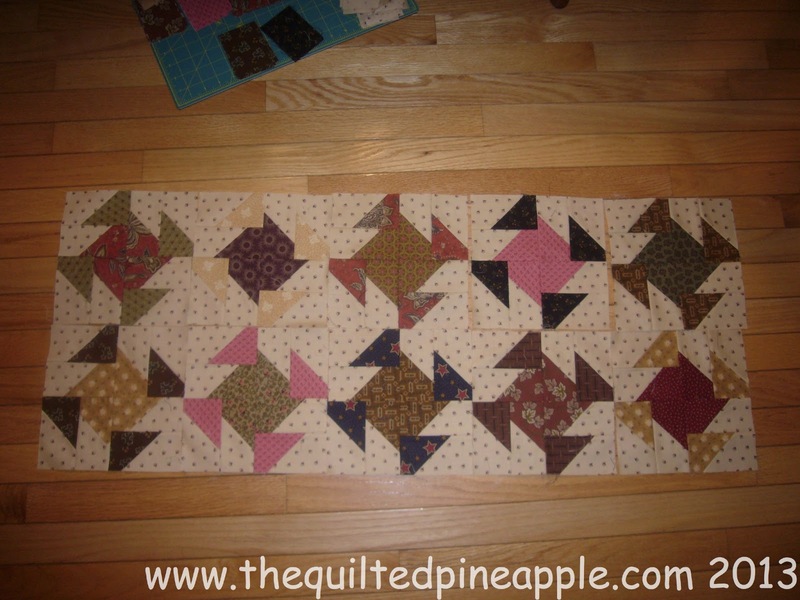 After a little set back, I decided I would incorporate those blocks because I really liked them into the quilt. 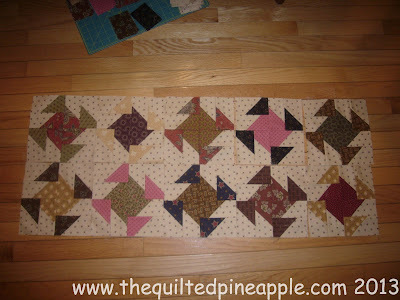 I added sashing between the blocks and decided a piano key border would look great and keep with the scrappy theme. Plus, I ended up with a ton of strips left over that were perfect for a scrappy border. I made a total of 81 blocks. The blocks went together easily with the Angler 2. You can read about it in my original post here. I was more than pleased at how beautifully my quilt turned out! I am by no means a designer!!! That's for sure. I graphed out my layout, figured out how many strips, and blocks I would need. To my surprise and shock, my quilt came out exactly the size I had graphed out!!!! Oh and for the record, I had to buy the background fabric 3 times!!! LOL!!! It is a Jo Morton print from 2 years ago that I was fortunate enough to find online!! The last time I ordered plenty and have some left!! As soon as it is quilted, I will reveal the horrendous thing that has been on my bed. I recently repaired a hole in it!!!! LOL!!!! My friend Patti said her dogs sleep with better!!!! Yikes. Absolutely stunning, Linda! I would be so proud of it for sure! Those "mistake" blocks aren't mistakes at all - Fons and Porter call them "Maverick" blocks!! I totally love that you kept them in the quilt! 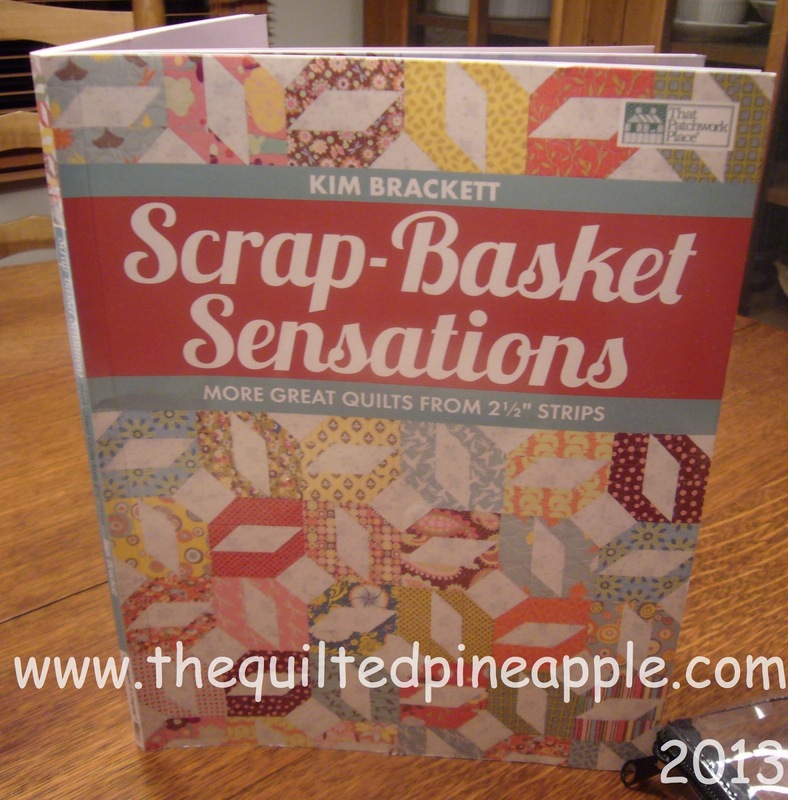 Now I'm tempted to get Kim's book out of my cupboard and make one! Congratulations on a gorgeous finish!!! applause, applause, applause a quilt for your bed. woohoo!!!!! It's beautiful, Linda. I love your story. This quilt/pattern is near and dear to my heart. 'wink'. Wow, Linda, this quilt looks gorgeous. Linda, I love the mix of blocks, how funny is that, I think you improved on the pattern. I think your color choices are wonderful and will work year round in your bedroom! I'm so happy that one of the best quilters out there is going to have a quilt on her bed, that's the way it should be! I love the alternate block that you did! Both blocks together are wonderful. I'm in the middle of sewing blocks together for a king-size quilt for us. Maybe it will be done in time for winter to be over?!! I love your quilt! Every time you walk into your bedroom you are going to be so happy to have it on your bed. Can't wait to see how you quilt it! Nice finish and even better that you get to use and appreciate it! Love your star blocks, glad you decided to keep them in. I love the "stars" mixed in. 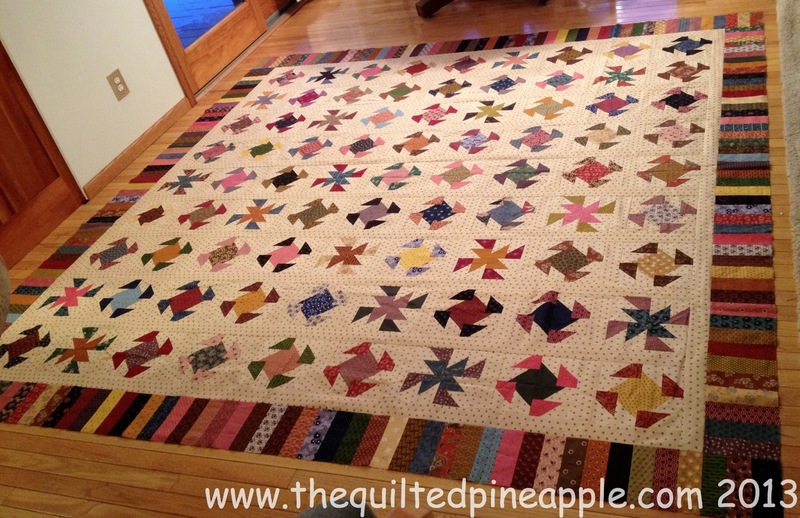 It's a gorgeous quilt and quite a feat to make a king size quilt...I've done it once. Congratulations on your progress. I know it'll really sing once you've quilted it. I have that pattern marked in the book and want to make it even more after seeing yours. I think the "mistake" blocks make it even more interesting. I love the quirks in old quilts including the maverick blocks. Oh it's just lovely, Linda! I know what you mean about the king sized bed. It is a huge undertaking! A job well done on this! What a unique block. Love it. How wonderful, Linda. I like the fact that you used your "mishaps". It'll be such a joy for you to see it on your bed!! Great finish!! Mission almost accomplished Linda! You have every reason to be happy! I'm looking forward to seeing the quilting you will do! Fantastic! 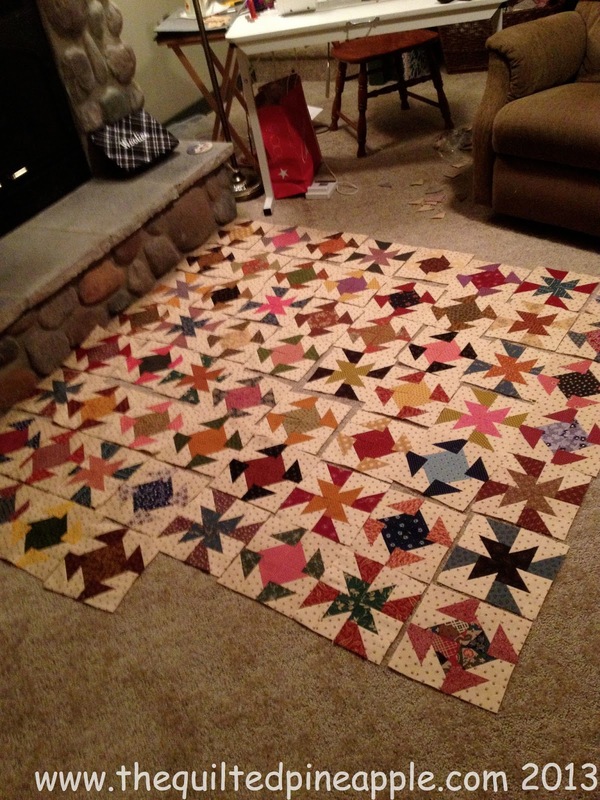 You will improve on things even more once you add your magic quilting! I really love the mix of blocks and think it adds interest to the quilt. Congratulations on a great finish. 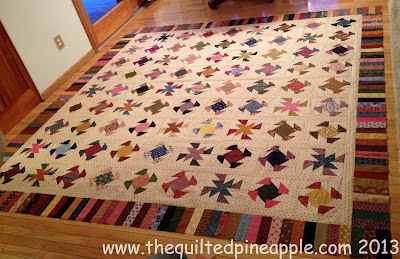 That is a beautiful quilt and can't wait to see it quilted. That is beautiful...you did a wonderful job! Isn't it funny that our beds are always the last ones we do! I made quilts for my sons as soon as they went into twin beds and again as they turned to teenagers...but our bed looked sad just waiting! I can't wait to see your quilting job!! You did a fabulous job on your quilt! 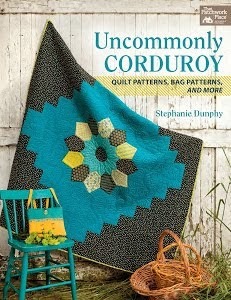 I love Kim's book and that is one of my favorite patterns in it! It will look great on your bed! Oh my gosh, 81 blocks! I just finished one with 64 and thought that a lot. Your quilt is stunning. I love it and the fabrics you used. You do beautiful work and I bet it it looks great on your bed. It is gorgeous! I've made a king size quilt, just one. It's on our bed right now. I understand the commitment such a large quilt demands. It took me a while to finish it and I took it to a friend for her to quilt on her long arm before I got my Sweet 16. I think I probably still would have taken it to her because it is just so big and heavy. Congratulations on getting it all pieced! Glad you found time to work on your own quilt and it's wonderful! I think it is very important to make time for yourself when quilting for others. What a wonderful, happy, colorful quilt! I love it! All those colors and that fun block pattern, great! 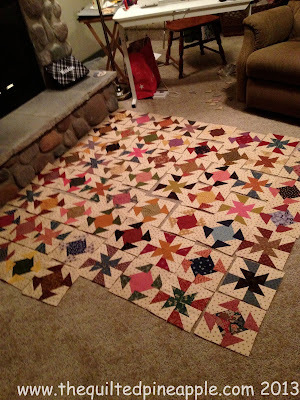 You were right to incorporate the blocks that look different, isn't that just what you see in some antique quilts? It makes the quilt even more fun. Great border, really a nice finish for this quilt. What a beautiful quilt. The addition of the pink colours really lifts the whole thing I think. Now I'm looking forward to seeing how you quilt it. I wonder if your "all-over quilting" design will be feathers? I love your quilt Linda. I too have a torn and tattered quilt on my bed, a store bought quilt that I love but it's seen better days. My husband says that I make quilts all the time yet we don't have a nice quilt on our bed. I hope to make one soon. 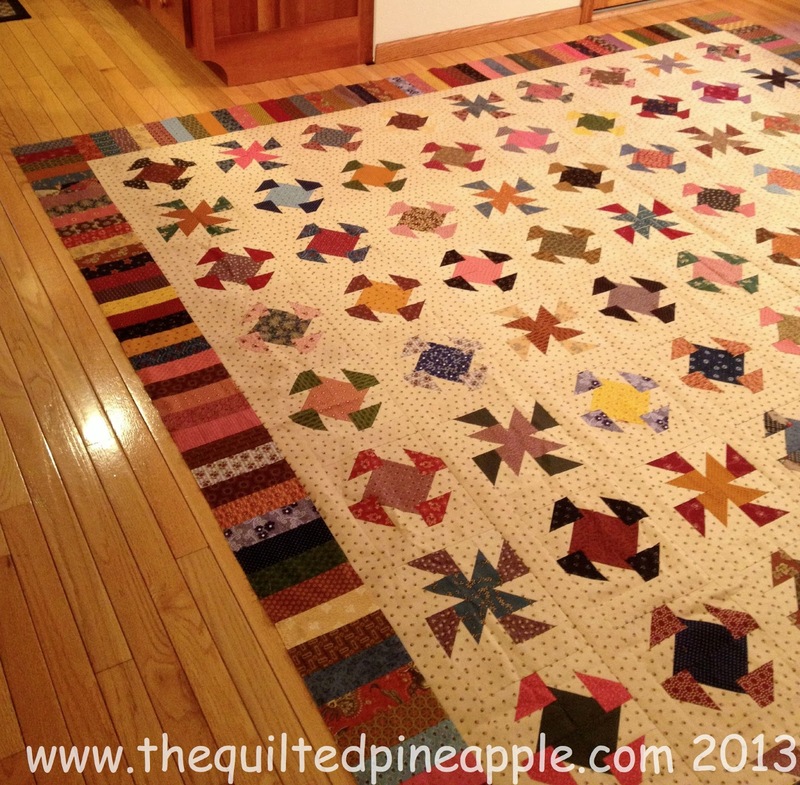 Please show this quilt again after its quilted. I like the pattern you used and colors too, very very nice. This turned out so beautiful. Can't wait to see how you quilt it. It is great. 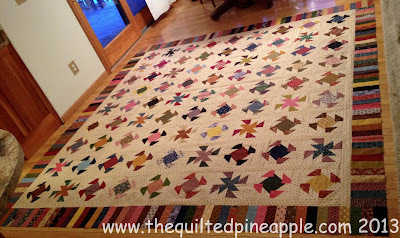 I did notice those "star" blocks in your original quilt photos and thought, "What a nice thing to have those mixed in." I think it's totally a happy accident! Love your colors. Love your design. 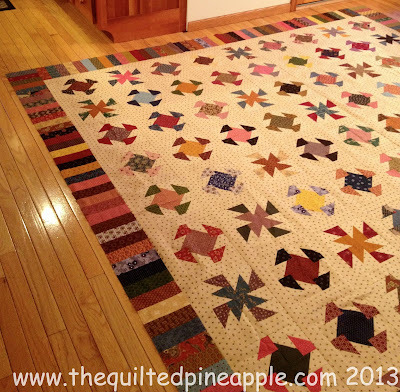 Big quilt! I have two king size ones I've made. Monsters! 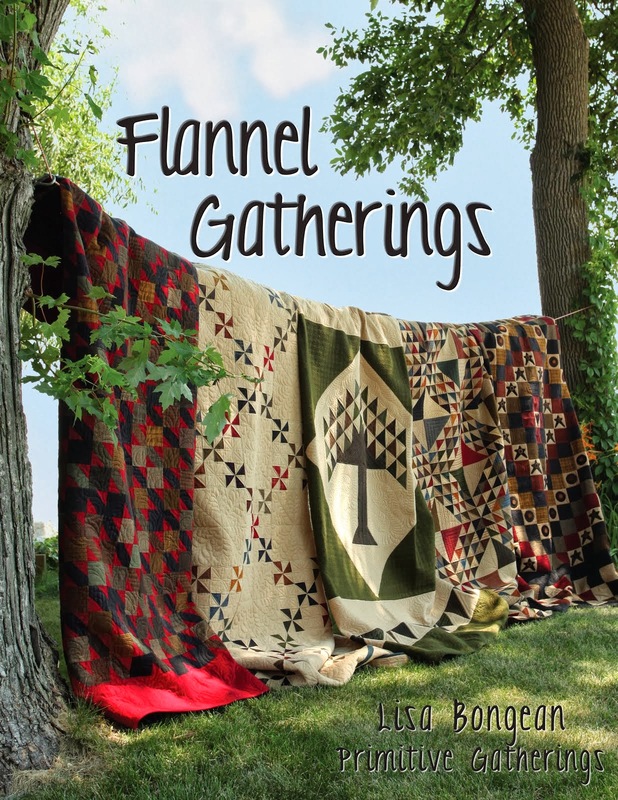 Wow - I have this book too, but I don't remember a quilt this wonderful in it! Now I have to go take a loot. Good job - look forward to seeing it on the bed. Wow! 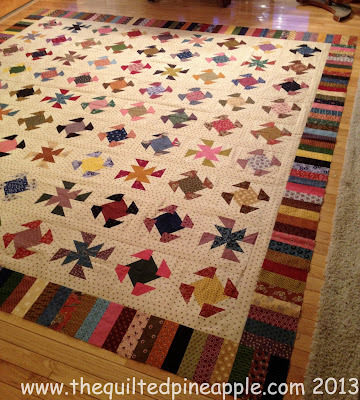 Your quilt is gorgeous <3 Congratulations on finishing such a monumental project :) I love the addition of the star blocks. I love it Linda! How exciting to have a quilt for your bed!! Lovely quilt and I adore the fabrics! I have the Scrap quilt book right next to me looking at it! 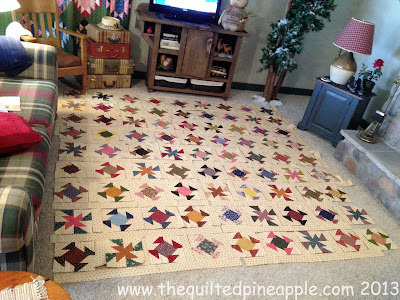 Is there a pic of how you quilted the Tool Shed quilt? I love Kim Brackett's book also. 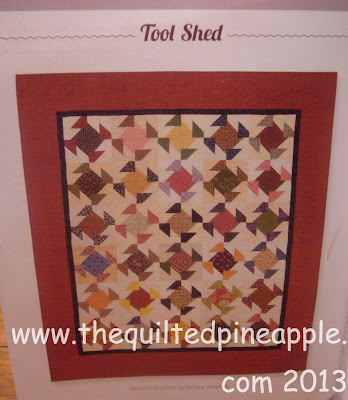 Amazingly, I was looking at the Tool Shed pattern just YESTERDAY thinking of making it! Glad to see yours. It's funny how things show up in multiples, like my looking at the pattern yesterday and today here's your quilt!